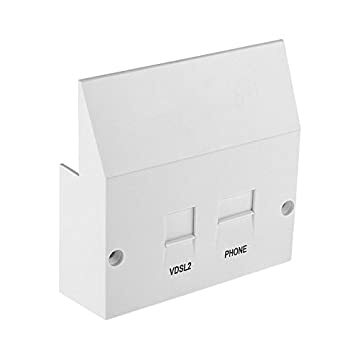 If I have a faulty faceplate - as supplied by openreach a few years ago, would this be replaced free of charge? It seems to be the first one. BT have got them to remove only the lower part of the faceplate and connect the phone to the test socket and after taking a little while to settle it now works fine, without any crackling. The BB is still connected to the upper part of the faceplate and it still disconnects a number of times a day. There is no extension wiring behind the master socket. I had thought of getting them to do that but I don't think they have a microfilter to hand - I'm just providing remote support! I'm going to send them a couple of microfilters. I think they have Openreach due out in a day or so - hopefully to replace the faceplate. It does sound like a faulty faceplate, yes? No, it sounds like a noisey line fault which will cause the internet to drop. Filtered faceplates can sometimes be faulty & sometimes it is more reliable to use an ordinary NTE5A + a dangler. Front plates very rarely go faulty. Mine did straight away! Maybe not "go" but more like "come" .